You know the old commercial: “You got your chocolate in my peanut butter! Well, you got your peanut butter in my chocolate!” And just like a Peanut Butter cup, it seems that Jane Austin and Zombies go great together. 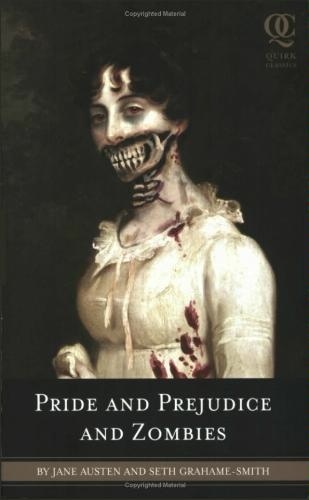 Pride and Prejudice and Zombies combines two very different genres from the farthest poles of the bookshelf. It smooshes together Empire waists with half-eaten brains. And, gosh darn it. It works. When I first heard about this satirical novel, I was listening to a gag on NPR’s “Wait, wait, don’t tell me!” I think the contestant had to identify the real new release book from a list of decoy books with fake plot lines. I don’t know about you, but I found it very hard to believe that Pride and Prejudice and Zombies was the real deal until I was standing in front of it in the “Employee Pick” section at Vroman’s in Pasadena, CA. Pride and Prejudice and Zombies is a hybrid of genres that is masterfully pulled off by the co-author. Yes, co-author. Because it technically is written by two different authors: Seth Grahame-Smith and, of course, Jane Austen. The brilliance here is that this whole enterprise could have just been a gimmick, but instead, Grahame-Smith proves that he is so skillful at mimicking the voice of his by-gone era writing partner, that the gimmick slides away as easily as rotted skin from a skull, revealing the fact that nothing should take itself so seriously that it can’t be made fun of every now and then. It is 70% Austen and 30% gory action, with Elizabeth Bennet as the proper English heroine trained in both the art of correspondence and the throwing dagger. Now, why, you may ask, am I (tweenteacher) reviewing a book that is most likely over a tween’s head? Well, I’m always up to something, and I’m percolating a lesson in amongst all this gore. I can see how this blending of genres exercise might be used in the classroom. I can see how this book might help inspire hybrid genres in my own classroom. I love the thought of the students mimicking the style of an author, of weaving their costumed voice into a classic story. I love the idea of students creating a C-storyline from some random pulled-out-of-a-hat, pick-a-card-any-card genre all while using the voice of the original author who represents an entirely different genre. First, of course, we would study the qualifications of each genre, identifying the key elements in that category. We’d study author’s voice and what distinguishes one author from the next. Then we’d pull pieces from Gary Soto or Langston Hughes, Ernesto Galarza or Ray Bradbury and weave in our own ideas using their style of writing. When I was a Fellow at the UCI Writing Project, we did an activity very similar to that where Catherine D’oust (educator, teacher mentor, cool lady) gave each of our small groups the same piece from a Woody Allen short story. Each group had to deconstruct the style of the author and mimic it in the ending paragraph. There was then a vote to see which paragraph was really Woody’s. My group received the most votes, deceiving our classmates into thinking that our’s was written by the neurotic filmmaker. Success! But I digress. The bottom line here is keep your eyes and ears open for lessons even while basking on the beach this summer. Pick up a book and let it take you away, but when you put it down, see how you can replicate its influence on your students. Lessons sometimes come from the most unlikely of sources, but only if you are open to the educator’s muse. Hello! Thanks for the review and the kind words about Pride and Prejudice and Zombies! I’m with Quirk Books, and I wanted to let you know that we’re coming out with a hardcover deluxe edition of the book in November – with 30% more zombies and full color illustrations! Visit our Quirk Classics Facebook page to learn more and to find out the newest title in the Quirk Classic Series on July 15. That’s right – there’s another classic literary monster mash-up coming… Fans of our page will receive a special Facebook update at 12:00 a.m. EST. If you’re not a member of Facebook, you can always check out QuirkClassics.com. Thanks, and glad you enjoyed Pride and Prejudice and Zombies!